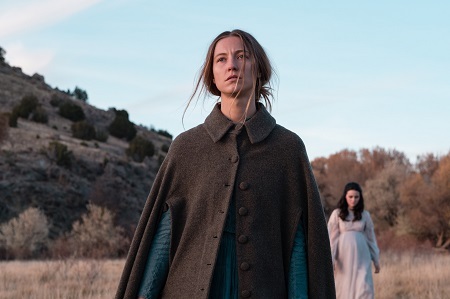 Somewhere on the windswept plains of the American frontier, Lizzy Macklin (Caitlin Gerard) lives with her husband Isaac (Ashley Zukerman). One day they are happy to welcome two newlyweds to their stretch of deserted nothing, Gideon Harper (Dylan McTee) and his pregnant young wife Emma (Julia Goldani Telles). The two women become fast friends, each learning about the other in intimate detail. But this isolation weighs on Emma and she becomes convinced the never-ending howl of the wind is hiding some sort of demonic presence intent on doing all of them deathly harm. Her growing terror leads to unimaginable tragedy, and while Isaac is off with Gideon dealing with the repercussions of a gruesome disaster, Lizzy is left alone, only her disintegrating psyche and panicked imagination left to keep her company for multiple days and nights at a time. 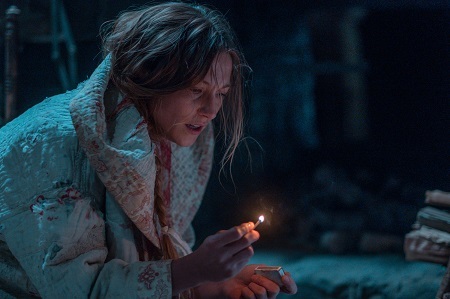 A striking psychological horror-western, director Emma Tammi’s debut The Wind is something special. Written by Teresa Sutherland, the movie is a devastating journey into darkness where fantasy and reality are in constant flux, Lizzy a stalwart figure of forthright courage who finds her grasp on the tactile practicalities of everyday life slipping as the night wind unforgivingly howls as if it were in constant anguish. Truth and fiction start to have no meaning, and even the appearance of a kindly Reverend (Miles Anderson) looking for a hot meal and a bit of pleasant conversation brings no lasting solace to the person most in need of feeling its comforting embrace. The nonlinear style of storytelling can be initially distracting. 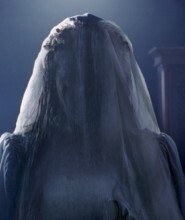 The movie opens with as shocking an event as can be imagined only to almost immediately double back to the moment Isaac introduces Lizzy to both Gideon and Emma. Yet, as the film goes on this presentation begins to cast a suitably nightmarish spell even if it is difficult to get a grasp on what is actually happening. Is all of this only a figment of Lizzy and Emma’s fevered imaginations? If it isn’t, if these visions and apparitions aren’t brought on by something psychological, if it isn’t madness, that means the demons born out of the shrieking winds whipping through the desert plains that Emma eventually becomes so terrified of are real, this constant question an unnerving conundrum that had me sitting on the edge of my seat eager to learn the answer to. I am haunted by this movie. Sutherland’s script is ephemeral and doesn’t spend a lot of time explaining what is going on. Yet its emphasis on Lizzy’s transformation, how it centers her in the story and refuses to pass judgment on any of her actions, all of this works in ways that are difficult to describe. The subtlety of this one woman’s journey into the unknown is striking in its ruggedly forthright resolve, her complexity as a protagonist slowly coming into increasingly intense focus as things build to their quietly devastating conclusion. It’s a meticulous piece of screenwriting where every piece connects to the ones next to it in multiple ways, making it up to the viewer to interpret the reality behind the finished picture even if the image itself remains purposefully indistinct. Tammi’s direction of Sutherland’s script is superb. 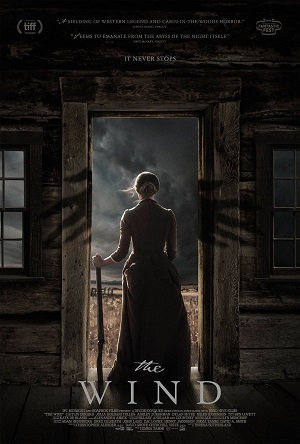 The filmmaker’s formalist western visual style echoes the likes of John Ford (most notably The Searchers), Anthony Mann (The Man from Laramie comes to mind) and Monte Hellman (specifically The Shooting), yet her determined concentration keeps things coming from a distinctly feminine sensibility which suits the material perfectly. Tammi achieves a level of discombobulating uncertainty that is rooted in the practical tactile realities of the situations Lizzy finds herself facing, Isaac’s tone-deaf reactions to his wife’s pleas for understanding and sympathy arguably more terrifying than the potentially supernatural evil that might be lurking right behind the man’s own front door. Gerard is incredible as Lizzy. She’s in virtually every scene of the film, and almost all that ends up transpiring is seen via her increasingly frazzled point of view. The actress does a sensational job giving Lizzy life, the strength of her presentation overflowing in small, almost minuscule cracks that cleverly hint at the deathly stark madness of the terrors that will eventually be unleashed during the story’s climactic act. Gerard’s scenes with Anderson, as brief as they are, are breathtaking, the two having a haunted back-and-forth that left me shivering in anticipation as to what the outcome of their meeting might prove to be. She also has terrific rapport with Telles, the byzantine nature of their relationship concealing psychological and physical dangers that will leave lasting scars, some of them lethal. I can’t get The Wind out of my head. Tammi’s intensely focused horror-western bursts free of its genre roots to achieve an emotional resonance that sends chills up my spine just thinking about it again now. This is a haunting foray into isolation and madness that has far more to say about what it is to be a strong, resolute woman than some may initially think it does, its windswept howls for acceptance and understanding helping make this motion picture a timeless stunner I’ll be thinking about and deconstructing for a very long time to come.